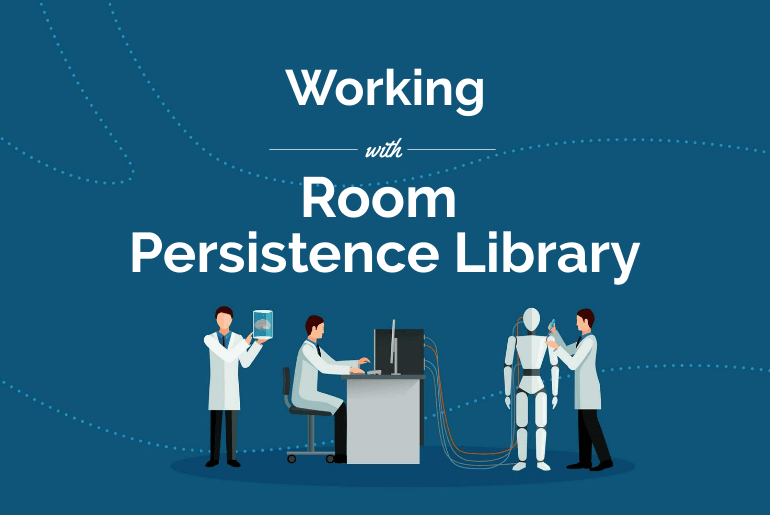 What is Room Persistence Library? how is provide an abstraction layer over SQLite to allow for more robust database access? In this article, I’m going to explain how to deal with Room Persistence Library in Android. What is Room Persistence Library? Google has introduced is a new Library for dealing database. It is a part of android architecture components that provide an abstraction layer over the SQLite to allow for robust database access the full power of SQLite. This library helps you to create a cache of your app’s data on the local device. This cache, which serves as your app’s single source of the key information within the app. whether users have or not an internet connection. @Database – A class with this annotations will create an abstraction layer for the DAO(Data Access Object ). @PrimaryKey – This annotation will set a primary key for the table. Let’s understand the working of Room Persistence Library with above annotation using with demo app. Open Android Studio and go to file menu, create a new project and fill detail and select EmptyActivity template and Finish. Open the buid.gradle and room persistence dependencies, Here is annotation processor is needed is for all operations like Insert, Delete, Update. Add more dependencies for this build this sample app and compileOptions VERSION_1_8 because we are going to use androidx lib. so full build.gradle look like below. Furthermore go head to creating database and entity class we have to create a DateConverter utility that convert Date to timestamp while inserting and convert timestamp to Date object while fetch data from database. So let’s create a utility class. Create a java class with getter setter and denoted it with @Entity annotations. On Database instance create table will created in database. Create a DAO class to database abstraction layer for accessing user entity. like below . For now, we will insert a demo content in the database after that fetch all user list from DB and display on the RecyclerView. Open the activity_main.xml and add RecyclerView and FloatingActionButton component. create a xml layout with named item_user.xml and create view for user details like profile picture name and email with delete button. Create a java class with named UserAdapter , onCreateViewHolder() methods is inflate the user item layout and onBindViewHolder() bind view with data holder. Fetch the data from database and display on RecyclerView. Before fetching data we have to insert some demo content in user table after that will fetch all user list and display over the RecyclerView. Open MainActivity add below code. Build and Run the project and selected targets device. as usual you MainActivity.java will open. Click FloatingActionButton and go the AddUserActivity fill user detail and click on Add. The user is inserted in database and displaying on the RecyclerView such as video in demo application.